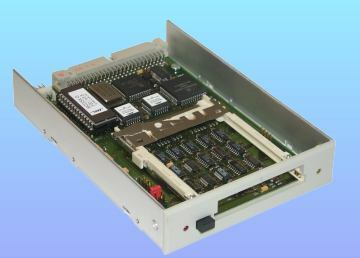 The MCDISK SCSI PC card drive extends a system's capability by adding a PC card interface to a variety of platforms not currently configured with such an interface. The MCDISK reader/writer provides universal access to all major memory PC-cards (Type I, II & II). MCDISK also supports LINKS Privacy cards, the FORTEZZA Crypto card and other PCMCIA I/O cards. The MCDISK has a standard SCSI interface and can be used like a normal removable harddisk. But its direct memory access (DMA) between the card and the SCSI port makes data transfer significantly faster and easier without needing specific drivers for the various platforms and operating systems for PCMCIA and PC-Card mass storage devices. The compact and rugged SCSI PC card reader/writer is available as a desktop version with built-in universal power supply or as an open frame version which fits in any 3.5" disk drive bay. The MCDISK SCSI PC card drive family of products has been thoroughly tested in the market since 1991 by a variety of vendors, in many applications and on a wide range of workstations and PCs.